You can't make this stuff up! 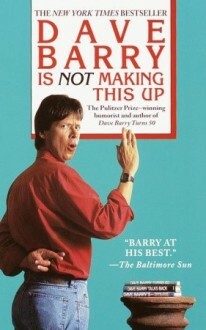 Dave Barry would never lie--and here are the real life, laugh-out-loud stories from across America to prove it: a U.S. Supreme Court justice shares his remedy for preventing gas ("I had not realized that this was a matter of concern in the highest levels of government"); a newspaper headline in Ohio announces the combustibility of strawberry Pop-Tarts ("A story that can really help you gain a better understanding of how you can be killed by breakfast snack food"); the frightening fact that snakes have mastered the pipelines leading directly to your toilet--and they're not shy ("Many women might view this as a fair punishment for all the billions of times that guys have left the seat up").So get up-close with Dave as he swears to tell the truth, the whole truth, and nothing but the truth . . . so God help you!